here is a 1947 photo of 12 year old Memphian Betty Joe Howell , on left, who killed her abusive 62 year old step father with a butcher knife. 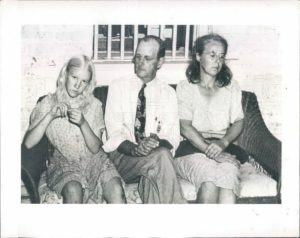 i dont think that is him in the photo, it might be…..but thats her mom on right.,he knocked her mom down and he pulled a shotgun on Betty Joe when she wasn’t fast enough bringing in some firewood…. so whats a girl gonna do,,,?…stab stab stab..
i am working on a Memphis Crime/Art book…specifically murders.. from the old days ,,,,1920s and 1930s ..it will be an art book about some of the murder cases. all are from Memphis Public Library records which were donated by the Police Department.. the brief details and number of murders from when Memphis was such a small town are shocking. i expect to be ostracized by hysterical people, probably. i am getting really old and i cant remember things.,. i have no assistant, i make notes for myself then i lose the notes….